If, like me, you love a bit of fizz of an evening you are in good hands here in Glasgow. Most bars have a bottle or two tucked away in their cellar but some special places serve up their bubbles with more zing and choice. I love to kick-off a night out with friends in cocktail mood. The right bartender in just the right place makes a huge difference to the buzz-factor of a good cocktail hour, so stick with me for tips to the tastiest tipples and trims in Glasgow. 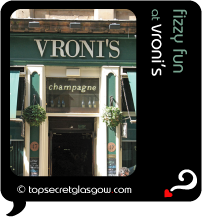 Vronis for Classy Champagne Fun in the City Centre. Great news! Finding this page means you can now join our VIP list for DRINK Champagne And Cocktails. Time to grab your very own page for DRINK Champagne And Cocktails. Do you have a special story about a time you decided to DRINK Champagne And Cocktails? A funny experience? A grand occasion? A funky photo? A personal tip? A top secret?